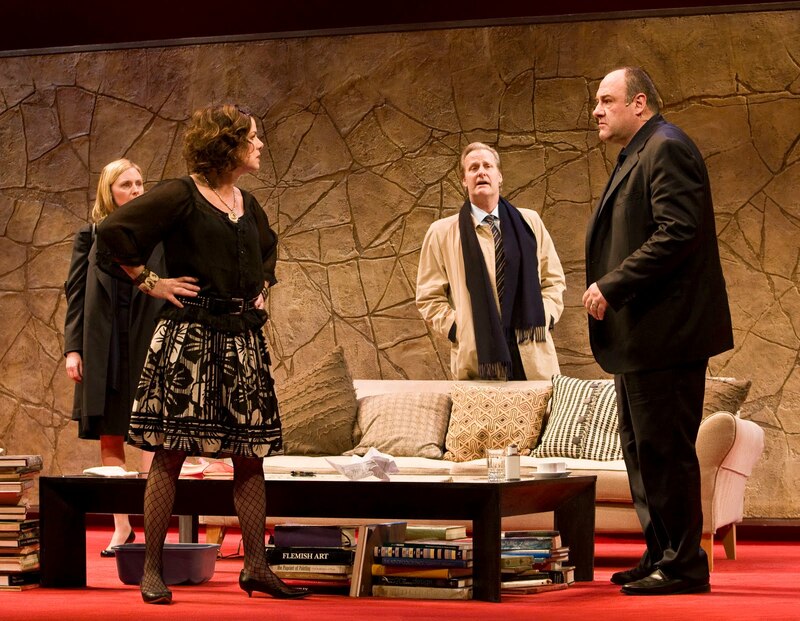 From our perch in the front row of the 1,800-seat Ahmanson Theatre, we could almost feel the spray of spit emanating from the New Jerseyed mouth of James (Tony Soprano – we can’t help it, we were Sopranos addicts) Gandolfini. 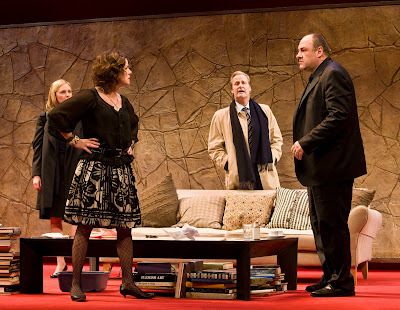 The occasion was the Los Angeles opening of Yasmina Reza’s mordantly delicious play, God of Carnage, which reunited the Broadway cast: Marcia Gay Harden, Hope Davis, Jeff Daniels and the world’s most brilliant mobster, er, wholesaler (toilet seats, anyone? ), the fantastic Gandolfini who also stars this month in HBO’s insightful film, Cinéma Vérité, about the making of the groundbreaking 1973 PBS documentary, An American Family, starring our friends, the Louds. Ralph and Alice get into it in the 50’s hit series. Clafoutis, projectile vomiting and tulip-tossing are but some of the physical touchstones in this shifting dance of agitated highs and lows. Reza is a formidable talent, having penned the 1995 Tony Award-winning Art, while the disintegrating marriages we watch in God mirror her own fractured union. Moving from espressos to rum, all to the constant irritating chirping of Daniels’ cell phone, this quartet strikes many a familiar chord, ultimately ending with the blunt realizations that the players are left to fend for themselves, much like we mortals do in real life. 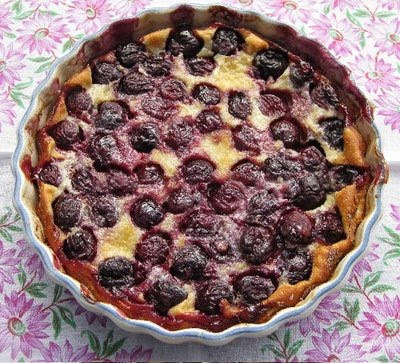 Clafoutis also has a starring role in Yasmina Reza’s God of Carnage. A spectacular night in the theater, the A-list crowd turned out to see this fearless foursome “take on roles that allow them to rip the stuffing out of one another, tear up the scenery, stomp on their own vanity and have the time of their lives”…or so said The New York Times. On hand for the civil disobedience were Brangelina, Will Ferrell, Martin Sheen, Anjelica Huston, Julian Sands, Eric Idle and a host of TV stars unrecognizable to us, big whoop. So, get thee to the Music Center (through May 29), and in the interim, for more dish on the play, here are our KUSC mini-chats with Hope Davis and Marcia Gay Harden; then give a listen here for the full interview on Arts Alive. Girl talk with two of the best in the biz! P.S. Roman Polanski is slated to direct the film version of God of Carnage, starring Kate Winslet, Jodie Foster, Christoph Waltz and John C. Reilly (originally Matt Dillon, but Reilly’s the better choice). Why movie peeps don’t use the actors who brought the work to trenchant life is a mystery, though this cast sounds cool. 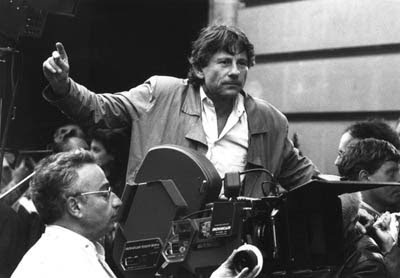 And the play, originally set in France but changed to Brooklyn in its American incarnation, will again be set in Paris, since Mr. Polanski is ostensibly still not allowed back here. This entry was posted in AHMANSON THEATRE, BRANGELINA, GOD OF CARNAGE, HOPE DAVIS, JAMES GANDOLFINI, JEFF DANIELS, KATE WINSLET, MARCIA GAY HARDEN, MATTHEW WARCHUS, ROMAN POLANSKI, THE LOUD FAMILY, TONY SOPRANO, YASMINA REZA. Bookmark the permalink.